Don't let anybody tell you that Europeans don't like powerful SUVs any less than Americans do. They just like theirs a bit smaller. Case in point: the new Audi RS Q3 Performance. The latest in the ne plus ultra from Quattro GmbH joins the RS6 Avant Performance and RS7 Sportback Performance in dialing up the power even further. 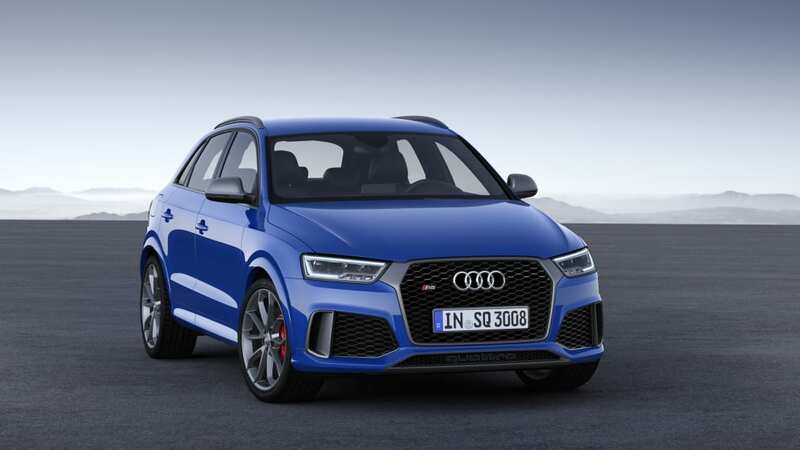 So while the 2.5-liter turbocharged inline-five carries over from the existing RS Q3, its output swells to 367 horsepower (27 more than before) and 343 pound-feet of torque. As a result, this tall take on the hot hatch blasts to 62 in just 4.4 seconds before topping out on the open Autobahn at nearly 168 miles per hour. 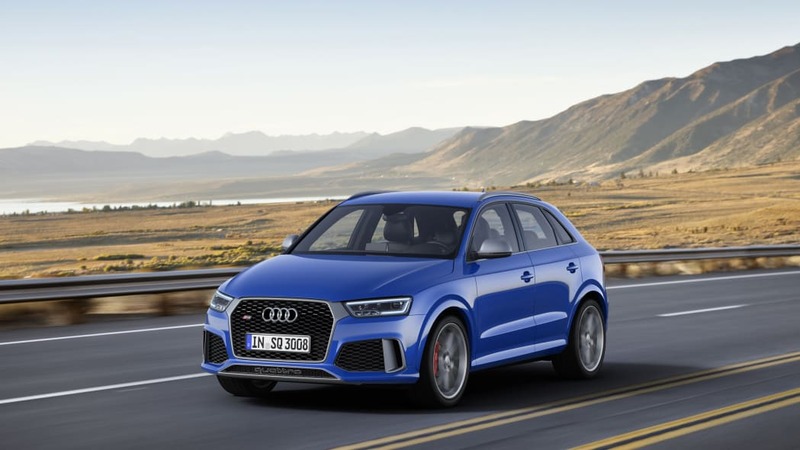 Along with the power boost, the RS Q3 Performance benefits from a retuned seven-speed dual-clutch transmission, which works in tandem with the hydraulically actuated, electronically controlled all-wheel-drive system to get the power down to the road. The suspension is lowered, with available adaptive dampers fitted to 20-inch alloys. There are subtle details inside and out to distinguish it from "lesser" RS Q3 models. 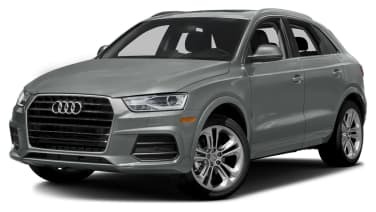 Unfortunately while Audi does offer the Q3 in base form here in America, it doesn't offer the RS variant altogether, let alone this new enhanced version. In fact the RS7 is the only model in the line we get here, so we'll just add this one to our growing list of forbidden fruit that we'd like to taste. Our compatriots in Germany, however, can pick one up right away for 61,000 euros, before it even makes its debut at the Geneva Motor Show next month. Audi ignites the next stage of performance in the compact, high-performance SUV segment: The Audi RS Q3 performance* impresses with an output of 270 kW (367 hp) and 465 Nm (343.0 lb ft) of torque. This incredible power catapults the new top-of-the-line model from 0 to 100 km/h (62.1 mph) in just 4.4 seconds. Standard top speed is 270 km/h (167.8 mph). The premium brand is honing its sporty profile with new RS performance models. The "performance" in the name stands for both a significant power boost and exclusive equipment that clearly elevates the respective model above the rest of the portfolio. 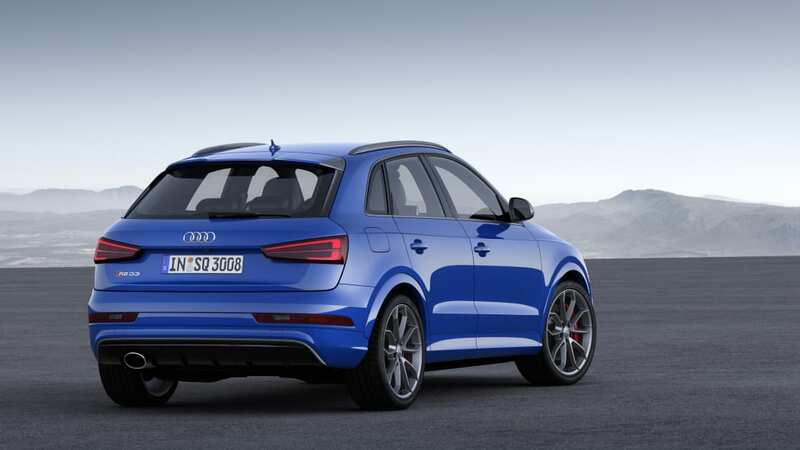 This also applies to the new RS Q3 performance, whose pulse is driven by the legendary Audi five-cylinder engine. Since 2010, an international panel of automotive journalists has named the 2.5 TFSI "International Engine of the Year" in its category six years in a row. With its pulling power, free-revving character and inimitable sound, goosebumps are guaranteed. 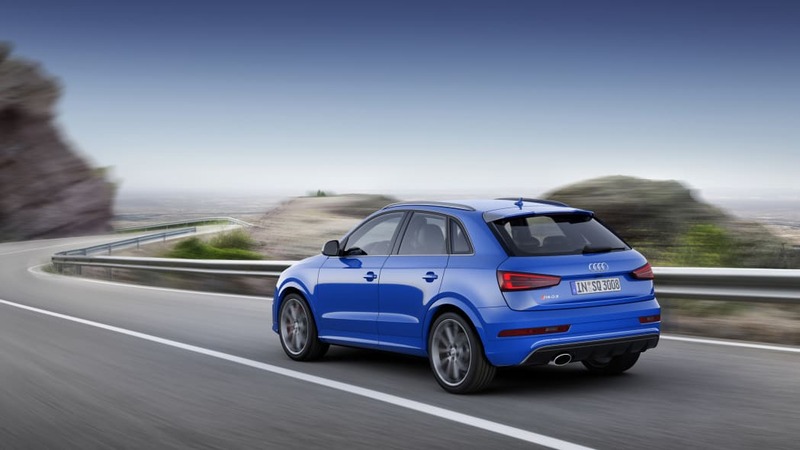 Compared with the RS Q3, Audi has bumped up the output of the 2.5 TFSI engine for the performance model. 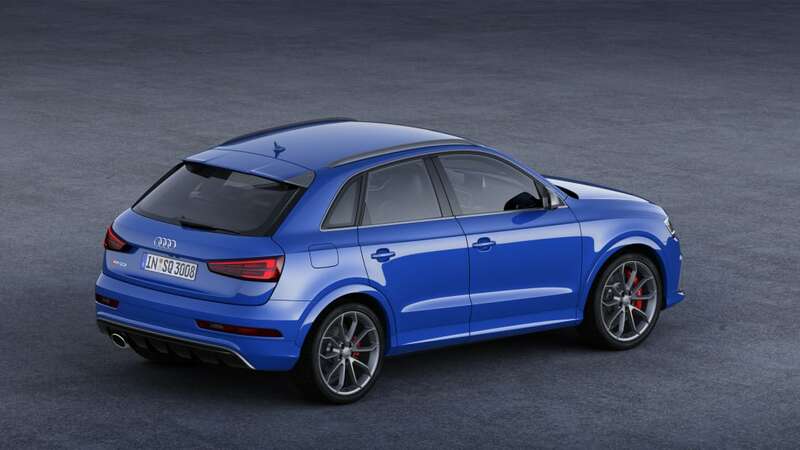 The developers increased the cooling capacity of the main radiator and optimized the fuel pump to give the five-cylinder turbo in the RS Q3 performance 20 kW (27 hp) more power. Peak torque of 465 Nm (343.0 lb ft) is available between 1,625 and 5,550 rpm. The sporty, compact SUV thus accelerates from 0 to 100 km/h (62.1 mph) in 4.4 seconds and reaches a top speed of 270 km/h (167.8 mph). Combined NEDC fuel consumption is 8.6 liters per 100 km (27.4 US mpg), corresponding to 203 grams CO2 per km (326.7 g/mi). The standard seven-speed S tronic has also been rigorously tuned for sportiness. The driver can either allow the extremely fast-shifting dual-clutch transmission to do all the work or change gears manually using the shift paddles on the standard RS multifunction steering wheel. In the dynamic mode of the Audi drive select dynamic handling system, each gear change is accompanied by double-declutching. The quattro permanent all-wheel drive smoothly delivers the engine's power to the road via a hydraulically actuated, electronically controlled multi-plate clutch. Power is distributed automatically between the front and rear axles as needed, and even selectively to each wheel thanks to the networked Electronic Stabilization Control (ESC). Furthermore, the handling controller can be deactivated to access a retuned sport mode. 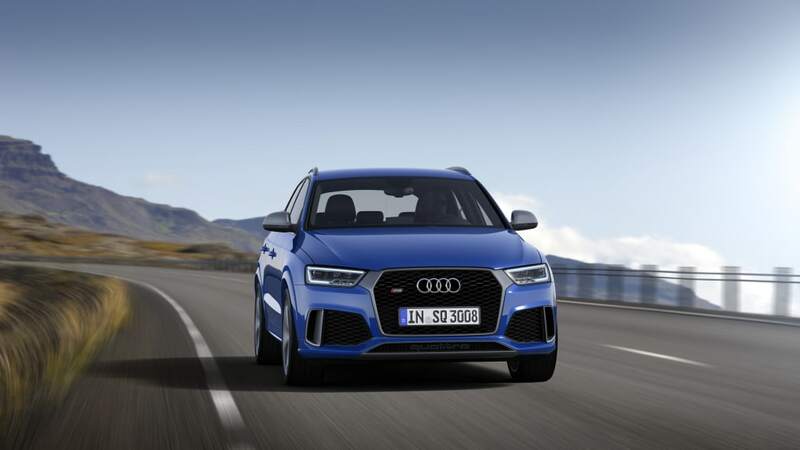 The taut RS sport suspension on the Audi RS Q3 performance perfectly translates the dynamics of the powerful engine and lowers the body by 20 millimeters (0.8 in) compared with the Audi Q3. Audi offers the RS sport suspension plus with damper control as an option. Its characteristic can be adjusted between the settings comfort, auto and dynamic via the Audi drive select dynamic handling system. The exterior design with its typical RS design details underscores the distinctive appearance of the Audi high-performance models. These include the sportily designed bumpers with large air inlets up front and the heavily profiled diffuser insert at the rear and the gloss black honeycomb grilles. The exterior of the RS Q3 performance is also characterized by add-on parts in a matt titanium-look finish that are exclusive to the new top model. The frame of the air inlet duct and the quattro logo within, for example, are finished this way. Other parts finished in matt titanium-look are: the Singleframe, the lateral flaps in the air inlets, the trim strips at the side windows, the exterior mirror housings, the roof rails, the upper edge of the diffuser and the fins of the roof edge spoiler. On top of that, Audi also offers the new paint finish Ascari blue metallic – another feature exclusive to the new RS performance models. Another highlight are the RS-specific, 20 inch wheels in a five twin-spoke V design. They are available exclusively for the RS performance model in a matt titanium-look finish, matching the standard add-on parts in this same finish. The RS Q3 performance comes standard with red calipers bearing the RS logo. Audi also offers the calipers in black at no extra charge. The dynamic line of the exterior design is echoed in the interior. The dial instruments feature gray faces, white dials and red needles. Audi offers the sport seats in the color combination black and blue with the optional RS performance design package at no extra charge. Additional elements, such as the RS sport leather steering wheel, the selector lever gaiter, the center armrest and the floor mats feature blue contrast stitching. Inlays in carbon twill blue, in which a blue thread is woven into the carbon material, round out this exclusive combination. 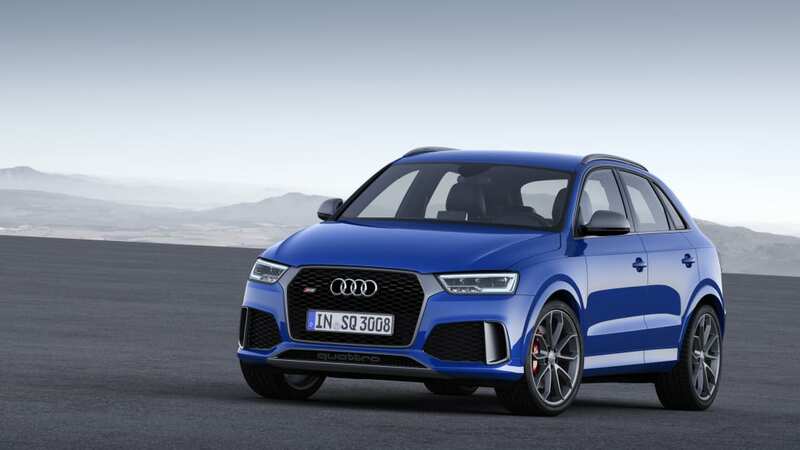 The Audi RS Q3 performance will celebrate its world premiere at the Geneva Motor Show in March 2016 and can be ordered in Germany effective immediately. The base price is 61,000 euros, and deliveries are scheduled to begin in the second quarter of 2016. More power, specific exterior details and an exclusive interior package: These are the key features that make the Audi RS Q3 performance* the premium brand's new top model in the compact SUV segment. The new Audi RS Q3 performance joins the RS 6 Avant performance* and the RS 7 Sportback performance* as the third member of the RS performance family. As the sporty subsidiary of AUDI AG, quattro GmbH is responsible for these high-performance models. 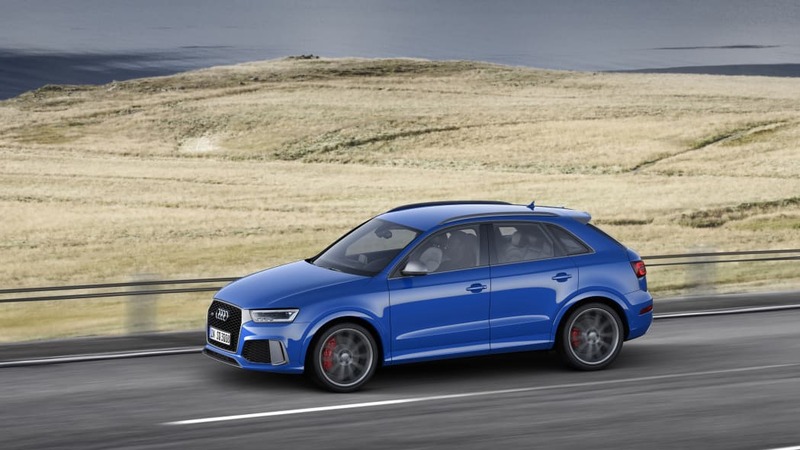 The output of the 2.5 TFSI engine has been increased by 20 kW (27 hp) to 270 kW (367 hp), helping the RS Q3 performance to a standard top speed of 270 km/h (167.8 mph). 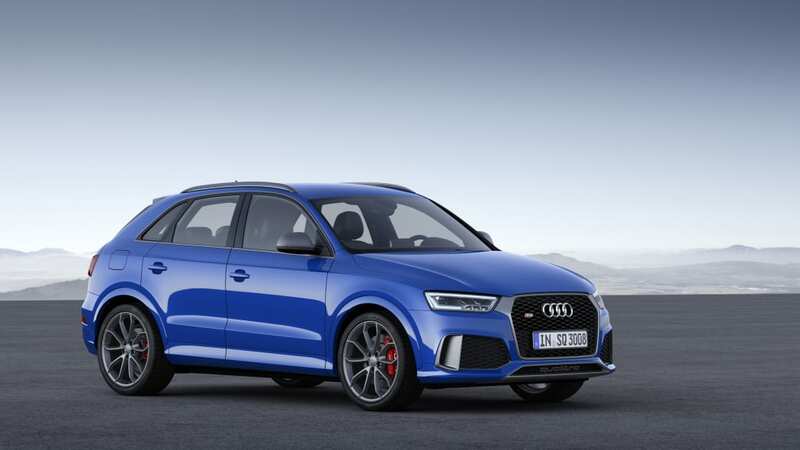 465 Nm (343.0 lb-ft) of torque is available from 1,625 to 5,500 rpm; the RS Q3 performance sprints from 0 to 100 km/h (62.1 mph) in 4.4 seconds. Combined fuel consumption in the NEDC cycle is 8.6 liters per 100 km (27.4 US mpg), corresponding to 203 g CO2 per km (326.7 g/mi). A recuperation system and a start-stop system contribute to this value. The emissions classification is Euro 6. The 2.5 TFSI has a displacement of 2,480 cc, the result of an 82.5 millimeter (3.2 in) stroke and 92.8 millimeter (3.7 in) bore. With tremendous pulling power, an extremely free-revving character and the characteristic sound of the five-cylinder's 1 ‑ 2 ‑ 4 ‑ 5 ‑ 3 ignition sequence, goosebumps are guaranteed. At higher loads and rpm, a flap in the RS exhaust system opens to make the characteristic sound even more voluminous. This five-cylinder engine is a modern classic. Since 2010, an international panel of automotive journalists has named it "International Engine of the Year" in its category six years in a row. Just 49 centimeters (19.3 in) long, the engine is very short. It weighs approximately 180 kilograms (396.8 lb). Its crankcase is made of vermicular graphite cast iron, an extremely strong, yet lightweight material. Perfectly placed reinforcements enhance the block's loadability. RS Q3 performance-specific refinements to the 2.5 TFSI include technical details such as a redesigned main radiator and an optimized fuel pump. A small team of specially trained employees build the 2.5 TFSI by hand at the Audi site in Győr, Hungary. The five-cylinder turbo's power flows to a modified seven-speed S tronic with very short shift times. The lower gears are closely spaced for sporty response while the seventh gear is long to save fuel. The driver can let the dual-clutch transmission do all the work in modes D and S, or can shift gears manually using the shift paddles on the standard RS multifunction steering wheel. In the dynamic mode of the Audi drive select dynamic handling system, each shift operation is accompanied by double-declutching. A launch control function provides full-throttle acceleration from a standing start. The primary component of the quattro permanent all-wheel drive system is a hydraulically actuated and electronically controlled multi-plate clutch mounted in front of the rear axle. The electronic controller combines stability, traction and driving enjoyment. Power is distributed as needed between the front and rear axles depending on the driving situation. Networking with the Electronic Stabilization Control (ESC) means that power is even distributed selectively to each wheel. As is typical for RS models, the ESC can be deactivated and has a retuned sport mode. 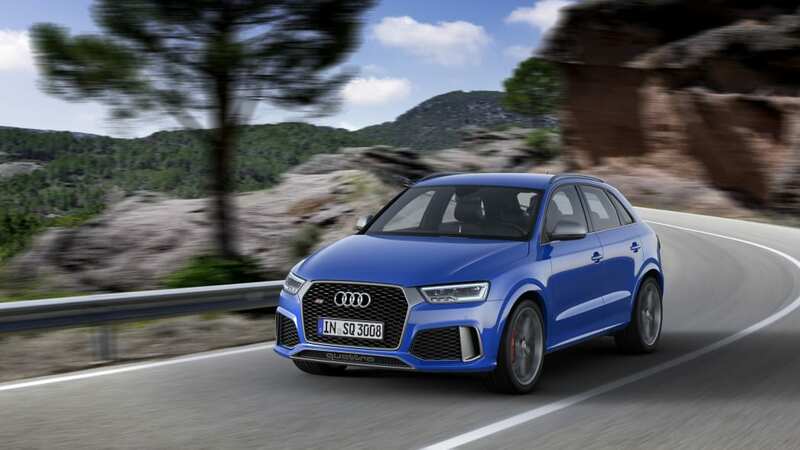 The taut RS sport suspension on the new Audi RS Q3 performance translates the dynamics of the powerful engine particularly well and lowers the body by 20 millimeters (0.8 in) compared with the Audi Q3. Audi offers the RS sport suspension plus with damper control as an option. The characteristic of the adaptive dampers can be set to one of three different modes (comfort, auto and dynamic) using the standard dynamic handling system Audi drive select. In Germany, the Audi RS Q3 performance comes standard with 20-inch wheels in a five twin-spoke V design in matt titanium-look. Additional 20-inch wheels in different designs and surface finishes are available as options. The front brake discs measure 365 millimeters (14.4 in) in diameter and feature a weight-saving wave design. In the RS Q3 performance, the eight-piston calipers with the RS logo come standard with a gloss red paint finish. These are also available in black at no extra charge. RS-typical design details, such as the sportily designed bumpers with large air inlets up front, the gloss black honeycomb grilles, the rear bumper with sculpted diffuser insert and the RS exhaust system with its large oval tailpipe underscore the sporty character of the Audi RS Q3 performance. 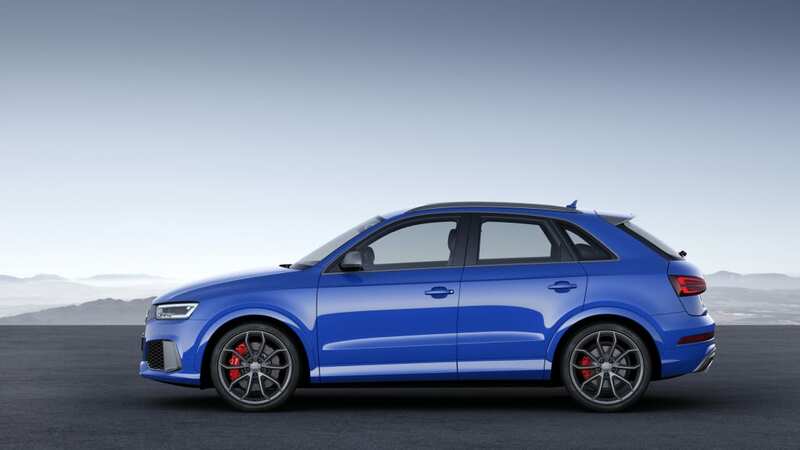 The exterior of the RS Q3 performance is characterized by exclusive add-on parts in a matt titanium-look finish. The frame of the air inlet duct and the quattro logo within, for example, are finished this way. Other parts finished in matt titanium-look are: the Singleframe, the lateral flaps in the air inlets, the trim strips at the side windows, the exterior mirror housings, the roof rails, the upper edge of the diffuser and the fins of the roof edge spoiler. The familiar matt aluminum and gloss black styling packages are also available upon request. 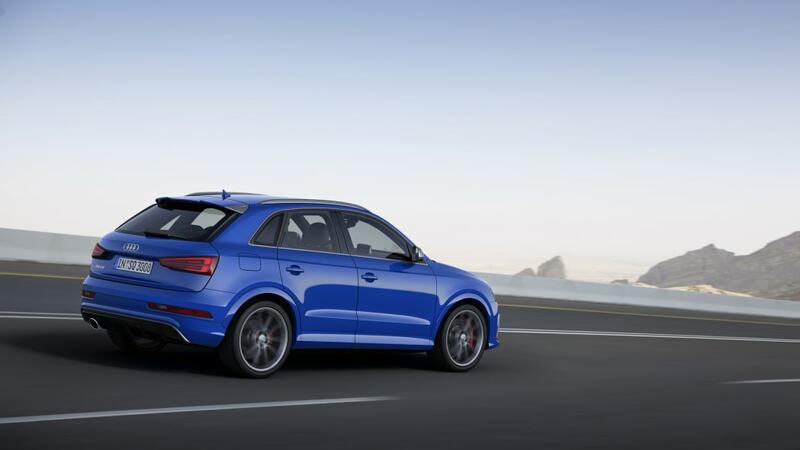 Audi offers the optional Ascari blue metallic paint finish exclusively for the RS Q3 performance. The dynamic line of the exterior design is echoed in the car's interior. The sport seats with the embossed RS Q3 logo are covered in a combination of black Alcantara and leather. Audi offers the seats in the color combination black and blue with the optional RS performance design package. A dynamic perforation pattern on the seat center panel tapers off diffusely toward the bottom and rear, with the blue that shines through providing for exceptional color effects. The RS sport leather steering wheel, which is flattened at the bottom, the center armrest and the selector lever gaiter get blue contrasting stitching. Inlays in carbon twill blue, in which a blue thread is woven into the high-quality carbon material, round out this exclusive combination. 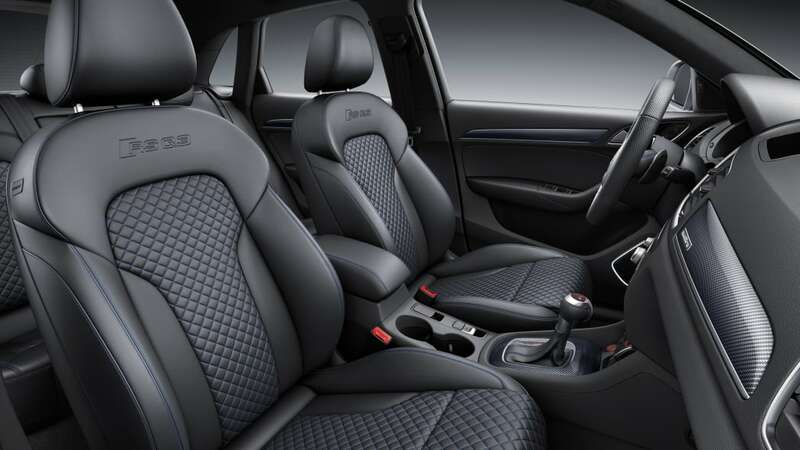 The seats can also be ordered in black or lunar silver fine Nappa leather with stone gray contrasting stitching. With the black variant, a diamond pattern in stone gray is also available. Carbon inlays are standard, with aluminum race or piano black available as an option. The instrument cluster has gray faces with white numbers and red needles. The color display of the driver information system shows boost pressure, oil temperature and a lap timer in a special RS menu. 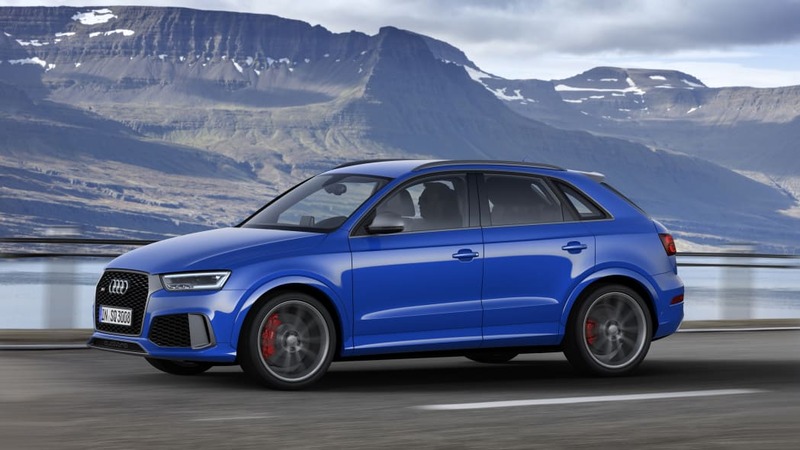 Besides the sport seats, the Audi RS Q3 performance also comes standard in Germany with the parking system plus, MMI radio, Audi sound system, deluxe automatic air conditioning and LED headlights. 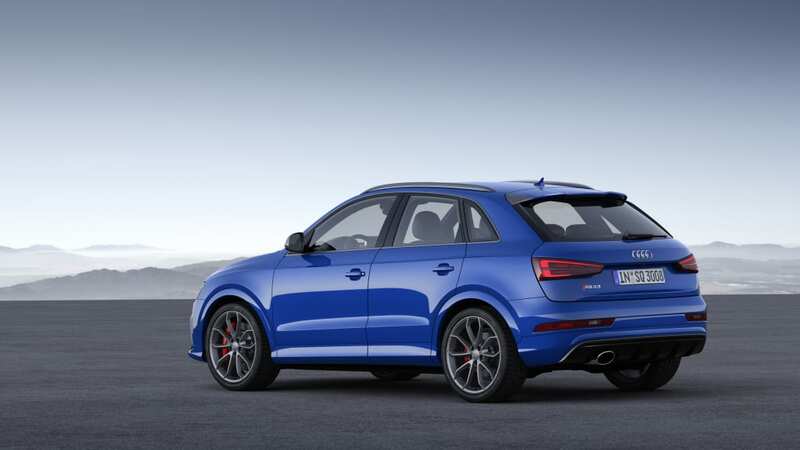 Orders are now being accepted for the Audi RS Q3 performance. It will celebrate its world premiere at the Geneva Motor Show in March 2016. The base price of the high-performance SUV in Germany is 61,000 euros. 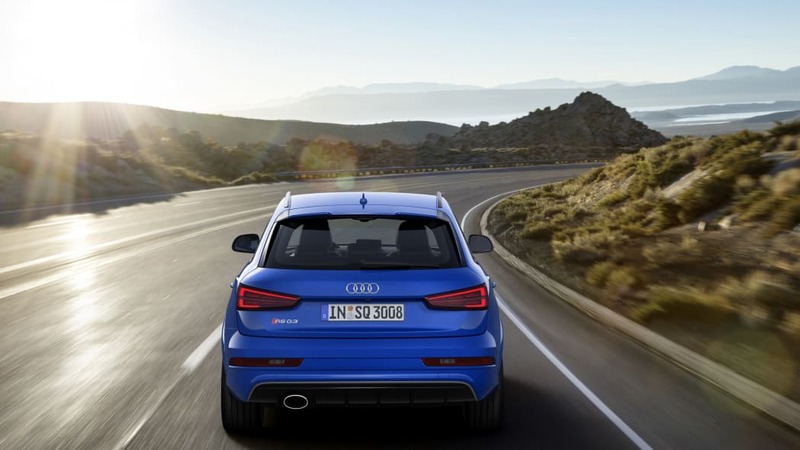 Deliveries of the RS Q3 performance are scheduled to begin in the second quarter of 2016.